The spiky hair phenomenon is available in a collection of different hair and visor color selections. Anyone with a head will enjoy the cleverness of this product by enhancing their image or just having fun with it! Whether you wear it seriously or just goofing around there is a HairHat for everyone and every occasion. Wear it to football, baseball, basketball and hockey games and you can bet people will ask you where you got it... that is if they realize it is not your real hair which people almost never do until you take it off. 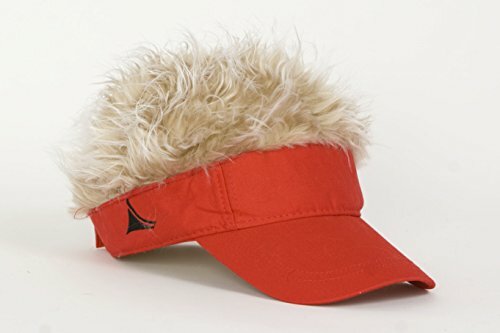 The Original FlairHair Visor with spiky hair is the quintessential Fathers Day gift. Perfect for sporting events or outdoor activities like golfing, hiking and skiing. Makes the perfect Christmas, Holiday or Birthday gift for Dad, Mom or the kids. High quality cotton/polyester is warm in the winter and cool in the summer. Visor is adjustable from 19-22 in. Machine washable, air dry. If you have any questions about this product by HairHat, contact us by completing and submitting the form below. If you are looking for a specif part number, please include it with your message.